Trottiscliffe church is a Pilgrim Church, a short distance from the Pilgrims Way which runs from Winchester to Canterbury. The church is a simple rectangular building with an added south tower. 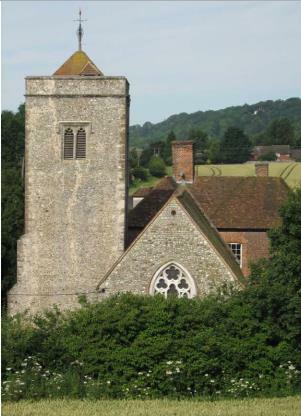 It is full of character and said to be one of the most rewarding churches to visit in West Kent. It is a Grade 1 listed, late 11th Century church of national importance due to the wealth of late 11th century fabric that survives in the nave and the chancel. One of its most fascinating features is the unusually large pulpit. It was actually brought from Westminster Abbey in 1824, having been given to the owner of Court Lodge (the Bishop’s Palace next door till the end of the 13th century) by the Abbey surveyor. The west wall of the church was rebuilt with knapped flints from local quarries in 1885 and is said to be as good as any knapped flintwork in Norfolk, home of this type of craftsmanship. The famous artist Graham Sutherland, one time resident of the village, is buried in the churchyard. The church is open every day from about 8.30am till 5pm, closing earlier in the winter.